Click here to visit the Walmart site and let it load. Once it does, click one of the 3 videos to watch. On the next page you’ll be able to fill out your shipping info. Allow up to four weeks for your free sample to arrive in your mailbox. I use your products all the time!! I love them so I know I will love this one also. it’s working in google chrome now! 🙂 thanks for all you do! i watched some silly teen bouncing all over but never did get my my free sample! BOO!! got one ty 🙂 worked fine for me in google chrome. I watched the video but the page was so long and it didn’t have a scroll bar to go down so I couldn’t enter for the free sample. I LOVE TRESEMME. USE IT ALL THE TIME. This is the product I use now on my hair, and I love it. I always love your products! Would love to try this out. I like to try some. 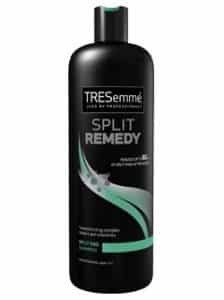 I have used TRESemme shampoo & conditioner before, but never the the one listed above, I was very pleased with the results, so I am sure this one would be great too. Hi this is Danette. I love tresemme shampoo.sign danette.